New NAHB Economics research shows that two million households headed by 25 – 34 year olds are missing from the current housing market but could have been active players if the headship rates remained at the 2000 levels. Instead, a rising number of young adults choose to stay with their parents or parents-in-law. 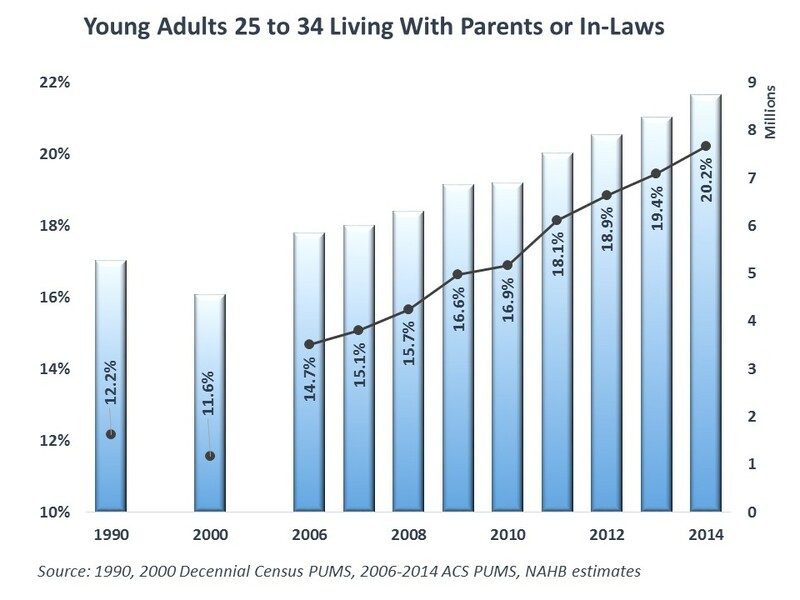 As of 2014, more than 20 percent of young adults ages 25 to 34, or 8.8 million, live in homes of their parents or parents-in-law. This represents a sharp increase since 2000 when less than 12 percent, or 4.6 million, lived with parents. Even going back to 1990, when the youngest baby boomers filled the 25-34 age bracket, those living with parents accounted for 12.2 percent, or 5.3 million. The rising probabilities of young adults to live with parents undoubtedly coincide with several recent demographic trends, such as the growing tendencies of 25-34 year olds to marry and have children later in life. A changing ethnic and cultural make-up of young adults proved to be less relevant since the share of immigrants in this age bracket actually declined from 2006 to 2014, and the share of Hispanics (who form larger households and later in life) fluctuated around 20 percent, with no clear trend, since at least 2006. Rising college enrollment did not contribute much to the long-run trend of rising shares of young adults staying with parents either. Less than 13 percent of 25-34 year olds were enrolled in college or other school, as of 2014. The comparable shares in 1990 and 2000 were just slightly below, close to 12 percent. The share rose from 12 percent in 2007 to 14 percent in 2011 but came back down to under 13 percent by 2014. These short-term fluctuations suggest that college attendance among 24-35 year olds is cyclical, rising during the periods of high unemployment and declining as the economy improves, but contributing little to the long-run trend of rising shares of young adults living with parents. Looking at 25-34 year olds who were able to strike out on their own and form their own households, the data reveal a shift toward renting and away from homeownership. Homeownership rates for this age group dropped from close to 47 percent in 2006 to 37 percent in 2014. The study points at the lack of income growth for young adults as a factor undermining their economic ability for independent living and homeownership. The analysis shows that 25-34 year olds were most severely affected by stagnating incomes. This age group showed virtually no personal income growth since 2006 while the median income for older groups grew almost 11 percent. The income gap also widened between homeowners ages 25-34 and those who stay with parents. Young adults who own a home are the top earners in their age group. They also registered significant gains in personal income (though not adjusted for inflation), with the median income rising from $26,200 in 2000, to $31,200 in 2006 and further to $35,000 by 2014. Meanwhile, young adults living with parents earn significantly less than their peers do, partially because they are twice as likely to be unemployed. More importantly, this group registered no growth in median personal income since 2000. More concerning, their median personal income is now lower than it was 14 years ago, $15,000 in 2014 compared to $16,000 in 2000. 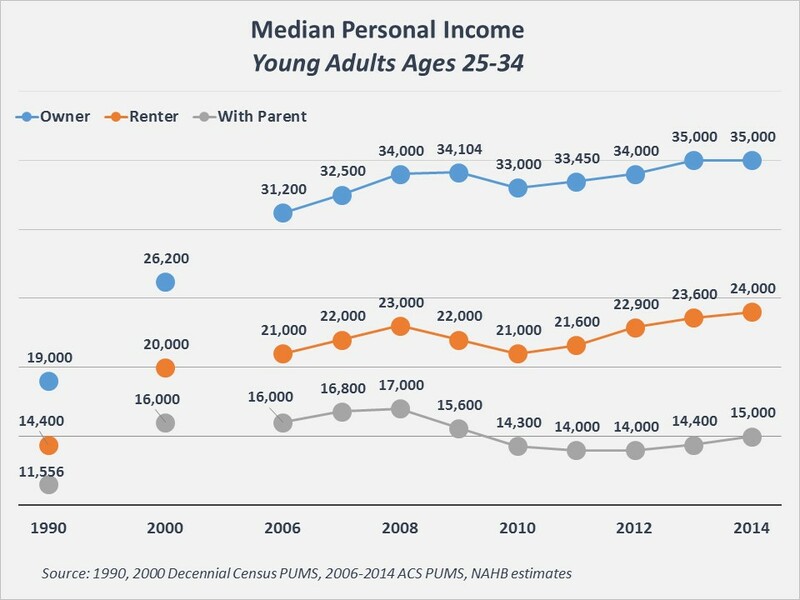 The analysis suggests that the income requirements for independent living, and especially for owning a home, increased over the years, leaving many young adults with stagnating incomes behind at homes of their parents. The complete NAHB report is available to the public as a courtesy of Housing Economics Online. The Median Personal Income chart would be much more informative if the living at home and renter data was broken down by gender. My experience has been that single females are much more financially savvy than males and provide an excellent target market for small condos and townhomes. They are much more likely to have savings, a good employment history and good credit. Most importantly, they are also more likely to see home ownership as a big positive. Not a single mention of the biggest driver of this trend, student loan debt? It now tops $1T in this country- more than credit cards! Men earlier in their careers used to be able to work at a mill, factory, or many other blue-collar positions… And could support a family on this. The trades now have some barriers to entry, as do office jobs… The only thing remaining is retail and service-level positions. These service-level jobs do not encourage the younger workers to move forward in life. Labor in this country is having trouble regaining its footing after losing so much ground. Corporate america seems very disinterested in helping. I’d like to see the college debt considered in this study and perhaps it is in the bigger study.